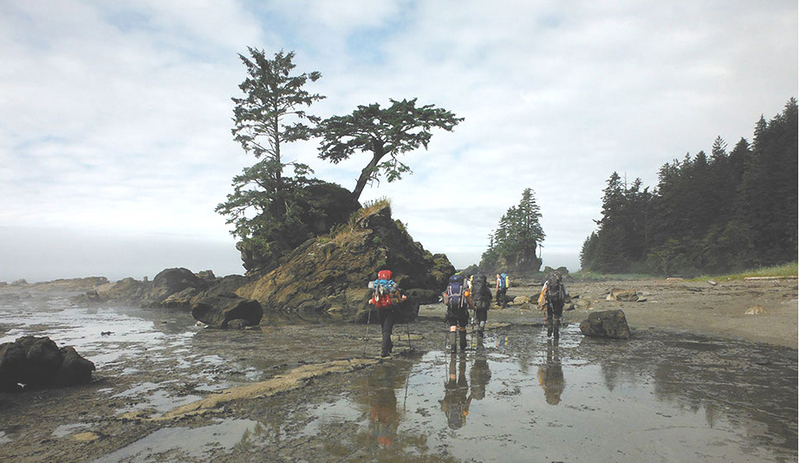 Brenda Jane Johnstone embarked on the hike of a lifetime, August 2014, as she and a group of 6 others traveled the West Coast Trail along western Vancouver Island from Port Renfrew to Bamfield with Sea to Sky. This is her story. This summer I embarked on the journey of a life time. To me it is the test of my own strength and willpower. 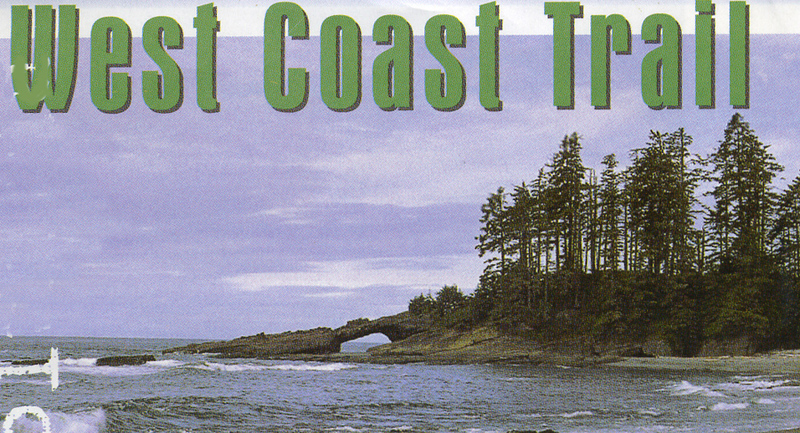 After training for more than six months doing lunges, weights, squats and interval cardio training, I left home to test myself alongside a great group amid the beauty that is the Pacific West Coast Trail (WCT). Our guide Beth; I call Beth our forest angel. What an inspiration she was to us. 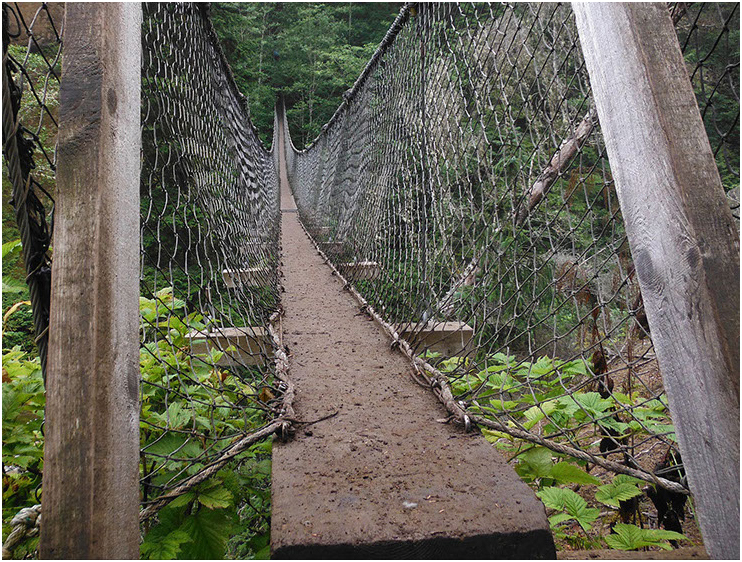 Beth hikes this 75km trail between six and eight times a year and has done this for 27 years. She’s smart, she knows “stuff” and she has a great sense of humour and is an encyclopaedia of local folklore and history. Beth made this experience so amazing I would recommend Sea to Sky Adventures to everyone and anyone wanting an amazing experience. Tyler, another guide, is young and eager. He’s the kind of guy you’d like to have as your little brother. He’s helpful and strong. Tyler is knowledgeable about the WCT and chatters away all day bestowing details of his life and adventures. When he’s not hiking this trail, he teaches lifesaving, is a ski patroller and participates in too many sports to mention. The night before our hike, we are in a hotel near the trailhead. I drag my gear from the suitcase and begin packing my backpack for the morning. Waking early, I grab my pack and head down to meet our guide Beth and the other hikers. LuAnn and her daughter Jessica are waiting in the lobby with Beth and they introduce themselves, we load the van and are off to pick up the guys from their hotel. On the ride we whisper to each other, “What if they’re all jerks?” That’d make this foray into the wild a nightmare and a test of willpower not to leave them buried in the bush but alas, upon meeting these men we are relieved to find they are funny, intelligent and as nervous as we are. We head to the ferry in Tswassen and land in Victoria for the drive up to Port Renfrew. We we head into the wild winding roads of the west coast of Vancouver Island. All three of us women suffer motion sickness so we are all sitting as close to the front of the van as we can with our noses pushed against the windows, eyes forward. As we arrive in Port Renfrew, we drive into a campsite, our first beach camp, check-in then drive along a really really bad road (Beth thinks it remains in this condition to thwart speeding campers). We unload our packs and other gear and head to the beach to setup camp. What a wonderful spot to camp in… There is a fellow named Bruce camping in a spot south of us. He has been in this same spot for 86 days. He’s from Vancouver and every May he heads to the west coast of the island with the intent of circumnavigating the entire island. Bruce has been on this adventure for seven years and lives in a small two-person tent with a huge driftwood tree which serves as his kitchen and living room. He builds a small fire to heat his coffee and to cook his meals. He tells me he is retired and that for the winters he sits and gets fat, then come May he loads his kayak, tent and other gear and heads west for up to six months of solitary life. He doesn’t get lonely as his daughter has been out this year a couple of times and his friends come to visit. He said this year his kayak hasn’t moved from the beach but he thinks he might make a move tomorrow and go around the point to a new camp ground. Once our camp is setup we head to a local restaurant for one last meal before we head out. This is a fabulous dining experience hosted by the Coastal Kitchen Cafe in Port Renfrew. Who knew dining on the edge of the world would be so great. Okay, back to camp and into bed. We’re to be up at 6:00 for an 8:00 am orientation at the Parks Canada office, then, off we go. Tonight is supposed to be the brightest full moon of the year and as I zip myself in all is calm and quiet under this bright sky. I awake to a bright tent and jump up, deflate my air mattress, roll and pack my sleeping bag, step into my hiking gear and boots, push everything into my pack and unzip the fly to step out and greet my fellow hikers and the world. Out I go! It’s very quiet and really dark with the exception of the brightest full moon of the year…..I look at my watch to discover it is 2:00 am in the morning! I thought, oh, for heaven’s sake. I sneak quietly back into my tent and with all the grace I can muster up and blow-up my air mattress, unroll my sleeping back, put my sleeping clothes back on and lay me down once again. I hope no one saw or heard me. Now, it’s 5:00 am and yes, I am again up before anyone but make the best of this as I walk the shoreline to the gently washing waves against the pristine sands of this lovely beach. Once everyone is up I re-pack my pack, eat a quick breakfast of fruit and yogurt and we are off to the park office to hear the lay of the land then it’s into the ferry for a short ride across the inlet to the start of this exciting adventure. Day 1 was a 13km hike that lasted almost nine hours. It was a process of slow torturous hiking through spectacular old growth forests of cedar trees large enough to walk through their root systems. Overhead was a magical forest of moss draped branches with circumference larger than most trees in our neighbourhood back home. We walked, crawled uphill for most of the morning winding our way along the precarious trail through a mystical forest. There is an almost eerie feel in the air, as if one could hear shipwrecked survivors from centuries past as they traversed on their journey to safe havens and civilization, and here we were on a summer adventure. This trail was originally a trail that was carved out by shipwrecked sailors who made their way up the cliffs to the forest and bushwhacked their way to safety. This was also the original telegraph line route. There are still many of these huge telegraph cables, the size of a wrist, running strung up among the trees, some with huge spikes holding them up and others dragging the ground. 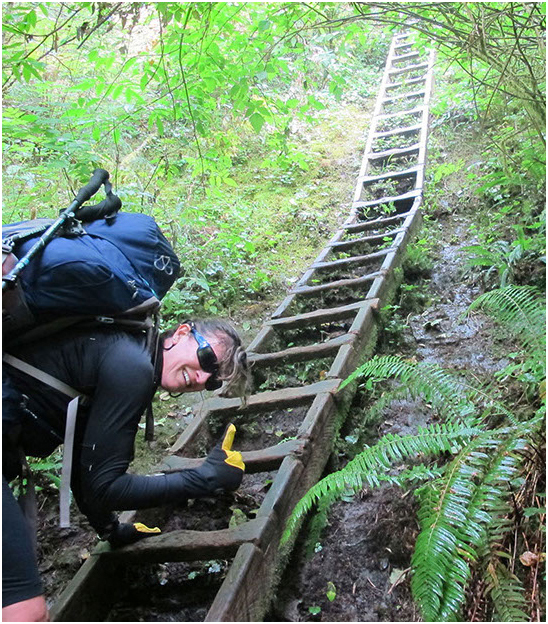 We faced 12 different ladders the first day, which I have to climb up and down carrying a 40+ pound pack. We stopped every km or so to drink or have a snack or just catch our breath. We made it to the end of this day by 6:00 pm and setup camp. I thought, “Oh my goodness what have I gotten myself into?.” I wasn’t sure if I could actually do this hike. I was hot, very tired and feeling like I was going to die. I took a couple Ibuprofens and ate salt liquorice. Twenty minutes later I felt like a million bucks and ready to start day two. Jessica, a fellow hiker and nurse, figured I had a touch of heat exhaustion and joyfully told me that after my 20- minute lie down, I looked a whole lot better. We were off to bed by 10:00 pm after a gourmet dinner by campfire and ready for the next adventure. I thought, “Oh my goodness what have I gotten myself into?.” I wasn’t sure if I could actually do this hike. I was hot, very tired and feeling like I was going to die. Day 2 began early, up at 6:00 am on the trail by 8:00 am. My ankles were swollen and my legs were stiff. The air mattress was not a pillow top mattress for sure, though the tent was comfortable but incredibly small; I can’t turn over. We were encouraged each night to put our smellies (anything with a scent) into the bear bags so that we wouldn’t encourage any camp creatures. Today is Boulder Day. What fun! As we walked the beach there was a message someone left, “Steve must die” (more on this later). This day was akin to being 10 years old and climbing up and over around and squeezing through large boulders any way we could. It was a fabulous day and so much fun, although poor Dave hated it. There is nothing like spending a day with the forest on one side and crashing ocean on the other as you meander through huge boulders. This was the best day of all with tidal basins and sandstone tidal plains. We lunched on top of sandstone flats overlooking many small fishing boats before making our way up into the forest. This portion of the forest offered large century old cedar trees and stumps from long ago logging as well as sections with slew like mud pits that we had to slog through. We reached camp with only three long downward ladders. There was one of three cable cars there. Me riding the cable car. 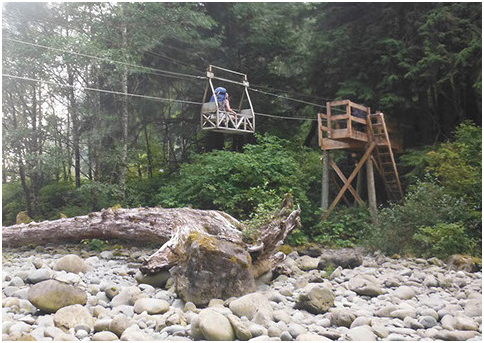 We had a choice of walking across the dry creek bed or taking the cable car. I wanted the car. Beth pulled me across while Dave stood beneath with the camera. We arrived at camp and found many other campers already setup. We were at the bottom of huge 20-storey high cliffs of sandstone and forest with the ocean in front. Life was good that day. This camp was a wonderful site to see with its huge great trees that had been washed up on shore and serve as the walls for the camp sites. We setup our camp and rolled up seats for the fire. Then we waited for our guides to present dinner. The food was remarkably good out there. Everything they served could be eaten with a bowl and spoon. That night we had delicious chili.After dinner we were treated to one of the Quu’as Guardians Corey who told very interesting stories of the local native cultures followed by native songs. We’d heard about this day and had been dreading it. Although it’s been two days since the start of the hike, this third day was the one we’d been warned about. We left camp 6:00 am so we could cross the tidal basin before the incoming tide. We were treated to walking on beautiful sandstone basins with beautiful clear water ponds filled with green anemones and small fish. Discussing a dead sea lion this was a beautiful change from hiking in the thick forest. The conditions were perfect. The skies were misty but without rain, we had nice breezes to cool us down but they didn’t slow us down. We traversed over rocky crags and then Beth lead us up into a river pass not shown on any WCT maps. 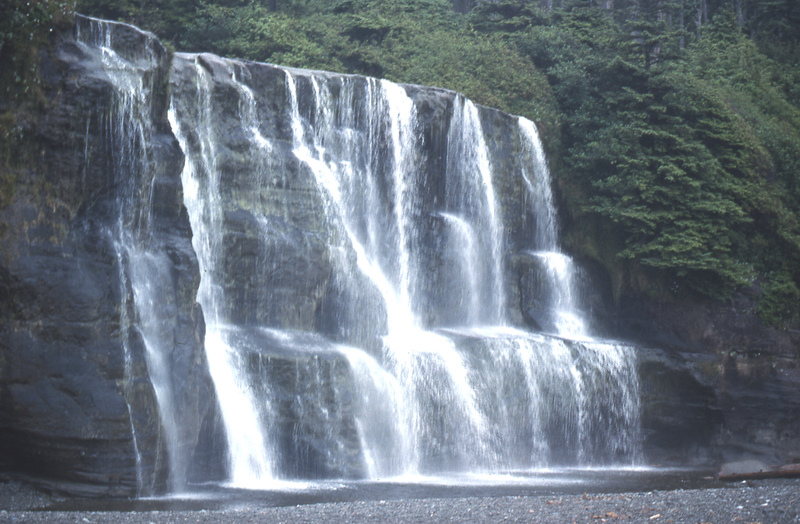 This is an emerald river basin where a gentle stream winds down from the forest atop emerald colored rocks. At the end of this basin is a huge graveyard of massive cedar tree driftwood; 60-foot trees with rocks pounded into them from the never ending tidal waters. We stopped for a 20 minute break and then… we were off to the dreaded ladders begin climbing down into one of many tidal basins to cross before the tide came in. We hit the first group of ladders just before lunch, all seven of them. These were the biggest ladders I’ve ever seen. The first few were 12- 24 rungs each, straight up. The trepidation of climbing up or down these ladders had all but passed. Now, I would just climb with no more worry about falling, well not much anyway the day was really just getting started. I made it up the first five ladders with ease. Jessica and LouAnn were waiting for me at the top of the 5th with Jess waiting for the reaction. I climbed the last rung, stood up and then looked up. I said, “Oh my goodness sakes, whose idea was this anyway”. The next ladder was 58 rungs straight up a rock cliff. I start the climb and six rungs up, my legs and arms started shaking because of exhaustion and I imagined myself lying at the bottom of the cliff on top of my pack. So, I climbed back down and told the guide I couldn’t do it. Our junior guide Tyler, bless him and his youth, said no problem at all, I’ll take it for you. I dropped my pack and off he went like a spider monkey up the 58 rungs with my pack. He came back down and I went up. Tyler was amazing. Thank you Tyler. We reached the end of the day’s hike with only three rather large downward ladders to go.I’m was so tired that my legs were shaking and I knew that at the end of these ladders a very long, high suspension bridge, that I am terrified of, awaited us. The height didn’t bother me, it was knowing that I could see beneath my feet as the bridge moved side to side and up and down. We’re asked if we want to walk the bridge alone or in a line. I want to go alone because I know any movement other than my own would send me into a panic mode so I sent everyone ahead. Beth waited with Dave at the back and everyone else had gone. I start walking slowly to get the feel of it. Yikes, it moved ever so slightly but enough that I held myself stiff in case I started hyperventilating. I was walking, almost double-timing it when Jess yelled, stop! I thought, “Omg what’s wrong?” the bridge was swaying beneath me. Did I mention this bridge was a 2” x 6” plank of wood with thin lines of steel angled upward to a rigid cable? That’s it, that’s all. I yelled at her, “Are you crazy, I can’t stop”. Jess said, “I want to take your picture so stop so I can focus”. What a Crazy woman! I was hyperventilating and I felt tears welling up… I wanted her to take the damn photo already. I was but running the last third of the bridge and relieved to make it. 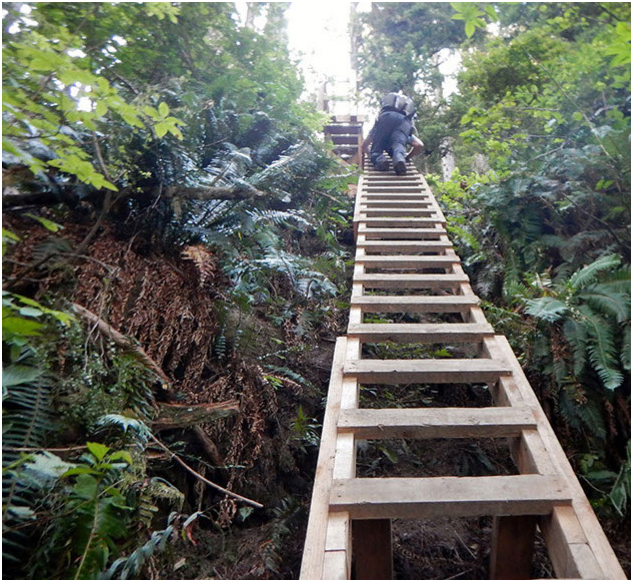 Then we climbed down to a few more ladders…. they were easy now. It had begun to rain. It was misty kind of rain, but as we neared camp the showers got heavier and arriving at camp we just wanted to get into dry clothes and then eat. One by one, as a group we setup our tents. Four people held a tarp up while two others put up tent after tent. This was to avoid the tents filling with water while we set up. I found that working with a group of people who get along so well, work together as a team and generally like each other, was one of the benefits of taking this adventure with a guided group. As soon as the tents were setup the rain stopped. This was the first night it felt like we needed to get wet; it was time to get a wash. Even if the tidal basin was freezing cold and the travel camp shampoo I purchased left globs of white gunk in my hair, even if my feet were so cold I had a headache, it was time to get some clean going on. Then we ate dinner and chatted by the fire before going to bed followed by another early morning. The next day we would go to Chez Monique, a restaurant on the beach. I start walking slowly to get the feel of it. Yikes, it moved ever so slightly but enough that I held myself stiff in case I started hyperventilating. I was walking, almost double-timing it when Jess yelled, stop! I thought, “Omg what’s wrong?” the bridge was swaying beneath me. Day 4—Chez Monique has been an icon on Carmanah Creek for years and offers hikers burgers, sandwiches, beer, sweets and soft drinks. Beth, our fearless leader though has a great relationship with Monique and her daughter and son-in-law and arranged a special treat for us. Hiking along we reach Bonilla Creek, a beautiful waterfall with waters cascading down into a basin before it flowed to the ocean. 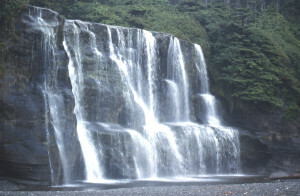 As we arrived we saw four young women naked in the falls. The guys in our group weren’t too upset with this afternoon vista. Beth was enraged though when she saw the women using bar soap in the clear crisp water and set about chastising them. If everyone washed in these waters with soap there’d be no clean drinking water for any hikers as these falls and streams along the way are the only clean sources of drinking water. We continued hiking knowing we’d get to camp early at Pachena Bay because this day was only a half day of hiking, and then we can washed up in the tidal basin, not quite as cold as the last but still freezing cold. A number of us had our fast drying clothes floating in the basin as we wash them out (using camp soap so we wouldn’t pollute any of the waters) and hang to dry before leaving for the one km hike along the beach to the nirvana of Chez Monique. We arrived late afternoon, the guys bought beer and dinner was served; three hot vegetables, baked potato, sour cream and homemade cordon bleu and of course the wine. You can’t imagine how good this tasted. We left with full stomachs and hiked the one km back to camp where we sit around a fire until bed. We’re up early again, Day 5 started with a back to Chez Monique were we were presented with a gourmet buffet breakfast to start us on our way. Life really doesn’t get any better than our past two days. We left with smiles on our faces and headed up the first ladder of the day to the Lighthouse at Carmanah Point. This lighthouse is one of a number of yearly manned lighthouses along the west coast. Reaching the top we are greeted with the sight of a cozy white bungalow with a red tin roof atop the cliffs beside the lighthouse. We spend a half hour or so wandering around amazed that this couple spend 24 hours a day almost 365 days a year on this remote piece of rock. While we were there a helicopter was in attendance along with a Coast Guard ship bringing supplies. The lighthouse keeper’s wife rushed by, carrying a box of tomatoes. A huge grin on her face she told us that she was pleased with her month load of groceries. I thought, “Oh, how we take the local food store for granted”. We head back up into the forest and walk through the mystical forest again until we reach a special bridge where our guide Beth told us to step lightly and leave no trace of our passage as we made our way to a private beach for the night. Beth received special permission for us to use this beach. It’s not on any map and as we emerged from the forest into the light, a large rusted boat that was ripped from mooring years ago and had washed up on the beach, was beside us. The boat (Defiant) had been on the beach so long that it had a large evergreen growing on her bow. I spent the evening up on the rocks listening to the waves crash against a rock face as I tried to capture the best blow hole photo possible. Twenty or more sea lions, who are just off the front of the rock wall in the ocean, watched me carefully. I’m not sure whether they intended to land up on my rock when the tide got higher, or if they’re just curious about me. We spend a half hour or so wandering around amazed that this couple spend 24 hours a day almost 365 days a year on this remote piece of rock. Day 6 we left camp around 8:00 am, after hiking through Clo-Osse forest trail, a beautiful forest trail with cedar boardwalks and re-growth forest we arrived at the Ditidaht Band’s Crab Shack and where eager to order fresh fish or crab, a baked potato and beer. We walked on old cedar plank boardwalks, through new growth cedar forests that sit atop muddy bogs. Our fellow hiker John, who we’ve since nicknamed Johnny Oops, took a fall from the boardwalk into the bog lying precariously atop his pack like a turtle upside down. His humor though is amazing as he said that the bog really just wanted his hiking pole, a pole that has broken in half and now was all but useless. Throughout the remainder of the hike Johnny Oops was watched over by us all as we waited for his next slip-fodder to laugh about at our next campfire. We reached the crab shack around 10:30 am in great anticipation. The surrounding dock had planters cleverly placed along the rails with fresh leaf lettuce, pole beans and romaine lettuce growing. 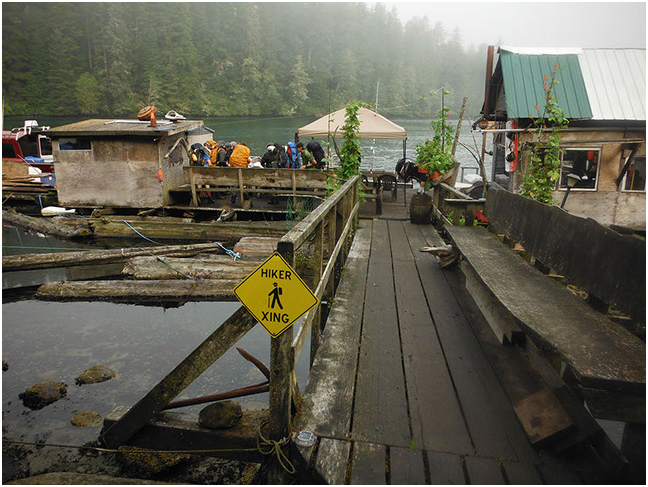 This welcome stop was situated on a dock on one side of a natural ocean lake, Cheewhat Lake that we need to cross to continue along the trail. But first, we enjoyed breakfast. There was the steady whack of hammers in the near distance. New cottages were being built on this reserve, complete with a cedar outdoor shower that will be rented out to tourists. The people that run and own this crab shack are extremely friendly. They seemed very happy to see us and welcomed us with photo albums showing recent catches of a huge 230 pound Halibut; crab the size of dinner plates and other wonderful seaside delicacies. We ordered our fare and sat at the 12’ long carved cedar log tables and benches. A table like this would fetch a hefty sum were it sent to the big city. The girls and I sat eating the best halibut I have ever eaten when Hippie Doug walked by and threw a handful of romaine lettuce on the table between us. LouAnn, Jess and I just looked at our guide Beth with a “what the…..” look on our faces. Beth smiled and withoutmissing a bite said, “Tossed salad”. During out short break we discussed what we liked or didn’t like so much so far on the hike. Dave spoke up and said, “I don’t know what I like better, my ear plugs or my toilet paper”. This was the humor we enjoyed all week. After our feast in the forest we boarded a Boston Whaler for the short trip across the channel of Cheewhat Lake captained by Hippie Doug. As we reached the middle of the channel a black bear sow and small cub could be seen on the opposing side of the channel. Because bears don’t hibernate in the area, cubs are born in the summer. We landed on the other side and as the girls are disembarking Hippie Doug placed a Werthers candy into our hands. The boys don’t get sweets from him. The rest of the day was spent hiking through ancient forest filled with old growth trees and thigh high ferns. There was a perpetual mist in the air that was so fresh and clean it was a joy to hike along these trails. Lunch was spent under a tarp as a misty rain began to fall but it was warm so this didn’t dampen any spirits as we hiked on through this mystical forest. Following our gourmet lunch of hummus, veggies, cheese and crackers we got back up into the forest for a time then went back to the beach where we passed by distant rock islands. There we could hear sea lions but they were too far away to get any photos and we had yet to see any whales. Making time across the beaches isn’t easy, we either walked on fine sand, which moved beneath our feet making gripping very hard, or on pebbles which move more than the sand, and then there’s the river rock size stones that are also challenging to walk on. It was painful for my feet to try to grip. This evening would be spent massaging tired feet and wrapping blister laden toes; thankfully I had the foresight to bring along a bottle of Absorbine Junior, this stuff is amazing. As we came up to the end of the beach there was sandstone cropping of rock where the tide was beginning to crash up. We had to scramble up and over this rock in a hurry, one at a time so we wouldn’t be unceremoniously dragged into the ocean. As we continued across the rock we saw our first glimpse of what is known as the Hole in the Wall, an arched walk-through the cliffs, onto yet another pebble filled beach. I was so tired and hungry now that the beauty was somewhat lost on me. We made it to camp, Tsusiat falls where many campers have set up, there was a large water fall with a high cliff and we put our tents up against it. After we set up our tents the girls headed to the outhouse, this one is perched especially high up and yikes, there was a line-up? Seriously, in the middle of nowhere, a line-up? Beautifully crafted composting toilets. Bring your own toilet paper. Envision a short line-up of muddy, dishevelled strangers with baggie in hand with the most prized of prizes, toilet paper within, standing in the sand with surf crashing in front and the sound of the falls to the side. Quite a sight for sure. The tide this evening was especially loud as it ricocheted off the cliffs and amplified it so that we are all but yelling at each other to talk above the noise. 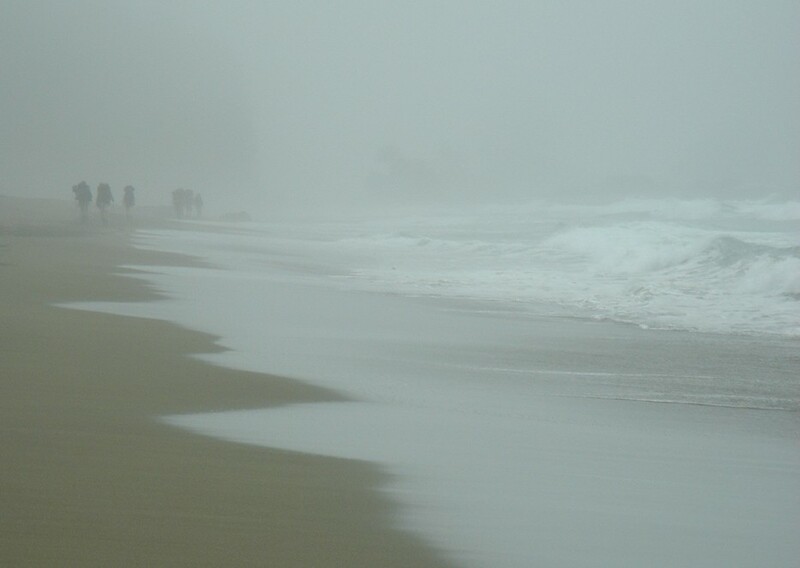 It was hard to discern whether the sounds were the waves or perhaps an ocean storm blowing in. We are dinner then sat around the fire talking. I can’t wait to get into my bag tonight, the wind off the water is pretty cold and the warmth of my little abode was calling me. My little abode for the 8 days. D ay 7, up again at 6:00am and hiking by 8:00 am. That day started with three ladders, up ladders of 18-20 rungs each. Good morning legs! We hiked 13km to Michigan Creek crossing through beautiful cedar forest filled with the vivid green of ferns, some wild Holly bushes and numerous muddy sections that now seem like just another day in the forest. No more dodgers in this group, now we just headed straight through the centre of these muddy bogs. Trusted the treads and trusted the gators. So far my feet were dry while the gators and hiking boots were muddy as muddy could get. Beth told us that dogging the mud uses energy needlessly. For the early day break we stopped at the site of a large rusted ship anchor. Throughout this hike Beth had read us stories of history past, from long past settlements to the telegraph lines and to long forgotten bush ‘donkeys’. 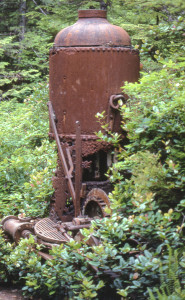 These bush ‘donkeys’ are huge metal machines setup on the mountain amongst the giant cedars. A hundred years ago these ‘donkeys’ were used to haul giant trees up and down the mountainside. 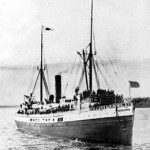 The story Beth read to us is the story of the ill fated Valencia that succumbed to the sea early in 1906. That year in January 136 passengers set out from Victoria heading north when, due to misreading the tides and depths, the Valencia ran aground crashing into a reef of rock. This was a sad story that ended with 106 men, women and children dying at this site. After the break, passing the rusty anchor, I stopped to say a prayer for those souls. Day 8, homeward bound. We rose again at 6:00 am and packed up camp for the last time. The end was near and off we went. There was one more Lighthouse to view before we ended. This one was also beautiful, pristine white with red tin roof, surrealrelly. Who would dedicate their life to signaling passing ships at the expense of social interaction? Special couples to be sure. We passed another bear and cub. We’d seen only a few bear and birds on this trip, although we did see some eagles, some resident sandpipers along the shorelines, and of course the ever-present seagulls. Each mile marker passed was another added to the adventure and another tug on the heartstrings of us hikers. Day one I asked myself if I could really do this. Now I asked if I could do it again with some clean clothes. As we came upon the mile two marker, the last marker on the trail, (we started at marker 75 and walked north) we took photos with mixed feelings. We took a left at the bridge and made our way to the beach outside of Bamfield for the final walk to the Ranger Station. Here on this beach we saw the first cougar tracks of the week. Secretly we had all hoped to see one but the footprint in the sand is the best we got. We came to the Ranger Station and all cheered our accomplishment. Many will never take this walk. To those healthy and fit I say, Do it. Challenge yourself to do something amazing. I am so happy I did and may just do it again. Next time I’ll know about the ladders.